The final product of Xiaomi company, Mi portable mouse is a wireless mouse that supports 2.4 GHz and Bluetooth 4.0 connections in two ways. This is something the Apple Magic Mouse 2 no. 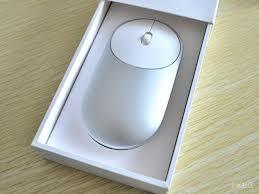 In addition, Mi presents portable mouse extreme portability with a small size and light weight. The sandblasted surface. With a small size, weighs only 77.5 grams. Perhaps due to the low weight, there is a strong sense of the metal to play, but more like a plastic material. It takes only a thickness of 23.6 mm, so that it can easily be placed in more laptop bags. The top of the mouse takes a circular symmetrical design and is made of plastic ABS, so that relatively easily and gets improved wear resistance. This is also a universal design for left and right hand. Side view, to use due to the low side height, laptop Mi mouse is more suitable for those with small hands. Otherwise, users with large hands may feel a little inadequate. Before first use, you must remove the transparent circular twisted cap at the bottom and the bottom right corner of the battery tab. If you must use wireless connectivity 2,4 GHz, you can connect the receiver to the PC and the power button, click to use to make the green. But if you need the Bluetooth connection, then turn on the blue light. You can press and hold the power button quickly the state of the blue flashing light and look "MiMouse" via computer or other means of correspondence and connection. Generally, Bluetooth mouse Xiaomi is more like a laptop mouse for mobile office work. Apart from the small size and portability, in my opinion, the biggest advantage of this mouse is to connect the 2,4 GHz and dual mode Bluetooth support.